(KZN.RU, April 13). The share of small and medium businesses in the city economy is growing every year in Kazan. Ilsur Metshin, the Mayor of Kazan, said this today at the videoconference in the Cabinet of Ministers of the RT. The share of small and medium-sized businesses in the gross territorial product of Kazan today reached 38.5% with VTP 768.1 billion rubles. The meeting was held by Rustam Minnikhanov, the President of the RT. 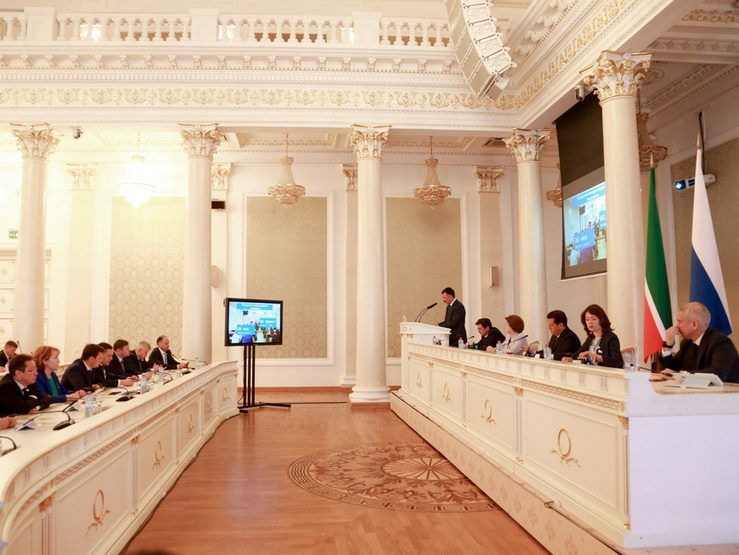 The head of the city spoke about the development of small and medium-sized businesses in Kazan, as well as what measures are envisaged for the self-employed in the capital of Tatarstan. In 2018, more than 80000 small and medium-sized businesses carried out their activities in the capital of the RT, it is by 1.2% more than in 2017. 44.3 thousand are small and micro enterprises, 238 are medium-sized and 36 thousand are individual entrepreneurs. The turnover of small and medium-sized enterprises in 2018 showed a significant increase compared to 2017. It was by 29.3%, or 187 billion rubles, and amounted to 826.2 billion rubles. The increase in Kazan was due to trade and manufacturing enterprises. In 2018, the city treasury received 4.8 billion rubles taxes from small and medium-sized businesses, it is 37.6% of the total tax revenues. In his speech, I. Metshin reminded that programs aimed at supporting entrepreneurs are being implemented in the capital of Tatarstan. In particular, the program of concessional lending. “In 2018, 94 enterprises received financial support from the municipality for a total of 20.4 million rubles. These are mainly production workers, representatives of the healthcare, housing and communal services, and tourism sectors”, said the Mayor. He added that this year the program conditions have been simplified. Applications from 15 credit organizations have already been received today, 4 of which are accredited and now lending. “This is only the beginning”, said I. Metshin. The project “Rental holidays” is being implemented along with the program of preferential crediting in Kazan. Thus, 2 more premises were realized at the auction last year. In total, lease agreements have been concluded on 59 premises with a total area of 8.4 thousand square meters. In his speech, the Mayor of Kazan also mentioned the topic of self-employed citizens. Tatarstan will become one of the four pilot regions where the mechanism of legalizing incomes of self-employed citizens will be developed through the application of a special tax regime “Tax on professional income”. Now more than 3000 people are registered as self-employed. “By the end of the year, this number should grow at least 7 times”, said I. Metshin. According to him, now a special municipal program of support for the self-employed is being developed for the first time in Russia. The most pressing issues were discussed with Kazan citizens at a meeting in the co-working “Kazan Express”. Moratorium on fines of self-employed on violations considered by the administrative and technical commission was announced in Kazan by the end of the year. The self-employed are planned to be included in the municipal program of concessional financing of small and medium-sized businesses, in addition, measures of property support for the self-employed will be provided. At the end of the meeting, I. Metshin reminded that this year Kazan will host WorldSkills Championship. More than 16 thousand people would visit the capital in the days of the championship. “Kazan small businesses will be involved in the championship, which will also give an increase in the turnover of small and medium-sized enterprises in the current year”, said I. Metshin.